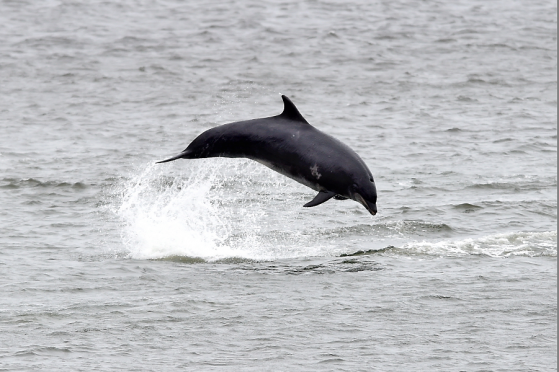 The rich variety of the north-east’s marine life has been highlighted by staff at the RSPB Scotland’s Dolphinwatch, who spotted mammals every day they were on site at Torry Battery this summer. Dolphins, minke whales, porpoises and even a lone humpback whale were seen by visitors to the viewpoint between May 10 and August 19. It is the first time in Dolphinwatch’s six year history that aquatic animals have been seen every day. There was also a 14% increase in the numbers sighted compared to last year’s viewing figures. As well as marine mammals, 72 different species of birds were spotted from Torry Battery, including ospreys, puffins and gannets. Dolphinwatch visitor experience officer Laura Watson said: “The high number of sightings confirm that Aberdeen is one of the best and most reliable places in Europe to see bottlenose dolphins. “Since May, thousands of visitors have been amazed by their gravity-defying leaps, tail-slapping and bow riding. “On average, the pod sizes have included about 14 individuals and we have been lucky to witness a very reliable group of five, led by our recognisable visitor known as Fitri or Quasimodo. For staff and visitors, the real highlight of the season came on July 21 when three minke whales passed by. More than 3,500 visitors attended the viewing sessions this year and the Dolphinwatch team are planning to build on that success next season with beach cleans, a school engagement programme and a marine-themed festival. To keep up to date with all sightings, visit www.facebook.com/pg/RSPBNorthEastScotland/posts.